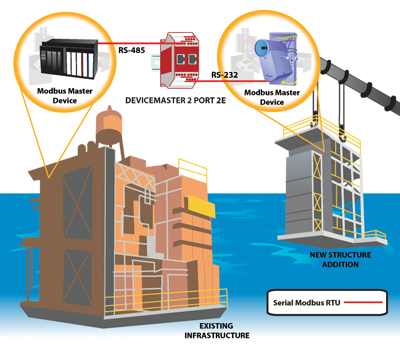 Each structure’s respective developers had invested substantial resources into their control systems, so the systems integrator needed to find a way to overcome this obstacle by converting one configuration to act as a slave in the most cost-effective way possible – or by making two Modbus master devices communicate with one another. Many industry experts have expressed that master-to-master Modbus communication is impossible, but Comtrol had already developed an innovative solution to make a Modbus master communicate with another master. The systems integrator assigned to this task researched master-to-master connectivity and ultimately discovered the DeviceMaster® UP’s capabilities on a respected online forum. Hesitantly beginning the application, the integrator was highly satisfied with the end result. As seen in the diagram, Comtrol was able to fix this integrator’s problem using the DeviceMaster UP 2-Port 2E Modbus gateway running Modbus/TCP firmware. Information coming from each control system/Modbus master device would be routed through serial Modbus/TCP firmware. Information coming from each control system/Modbus master device would be routed through serial Modbus RTU into the DeviceMaster UP. Internally, the firmware essentially provides a Modbus slave to respond to each (external) master’s commands. The slaves are then internally linked to each other to complete the communication process. Without viewing the internal configuration, the end user only observes that the DeviceMaster UP enables a successful connection from one master to another. The Modbus/TCP firmware is the original DeviceMaster UP Modbus application. It has been designed to provide great flexibility for connecting both Modbus serial slaves and Raw/ASCII devices to a variety of Modbus controllers and applications. Such advanced Raw/ASCII options as filtering, command/response mode, peer-to-peer Modbus communications, and simultaneous connections to multiple Modbus controllers and/or Ethernet TCP/IP applications make the Modbus/TCP firmware the flagship of all Modbus gateways.